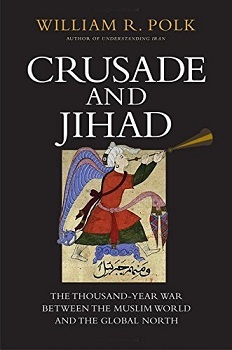 Crusade and Jihad is characteristic of the many misrepresentations of history that emanate from the Middle East studies establishment. Despite the title, the book allots only some 30 of 550 pages to the first millennium; 95 percent is devoted to the nineteenth and twentieth centuries. The reason for this lopsided approach becomes evident when one understands Polk’s thesis: For centuries, Islam was a progressive beacon in a dark world—until an envious, rapacious, and imperialistic West ruined it all with colonialism, the cause of all the Muslim world’s woes. But history tells an antithetical story: “For approximately a thousand years,” to quote Bernard Lewis, “from the advent of Islam in the seventh century until the second siege of Vienna in 1683, Christian Europe was under constant threat from Islam.” By ignoring this millennium, Western intervention in the Muslim world is presented in a vacuum and easily vilified. Even colonialism is misrepresented. Whereas Muslim jihads often culminated in slavery, depopulation, and devastation, European colonialists abolished slavery and introduced their Muslim subjects to modernity, from scientific and medicinal advances to the radical concepts of democracy and religious freedom. Even so, Polk contends: “Memories of [Western] imperialism are deep [among Muslims], and they helped create much of the world’s disorder and danger today. … A century or more of invasion, occupation, humiliation, and genocide has left scars that are still not healed.” Every Islamic terror group is allegedly a product of “the anger and frustration of Muslims”; this despite the Islamic State (ISIS), among others, repeatedly explaining it hates Westerners only because they are infidels. “We do ourselves no favors by airbrushing away the scars” of the past, insists Polk; yet his book does just that. Worse, by presenting a distorted picture of the past, it offers only distorted policies for the present—such as appeasement—that are destined to fail.